The chilli plants at home had a mealybug infection and it took all of my resilience to finally have it well under control. I do not think it will ever permanently go but will probably be a constant exercise of management. What helped was a combination of aggressive pruning and washes with vinegar and Dreft dishwashing liquid soap. I tried many insect sprays to realize that the only way out was to cut off the most affected areas. Come to think of it what a metaphor for life! 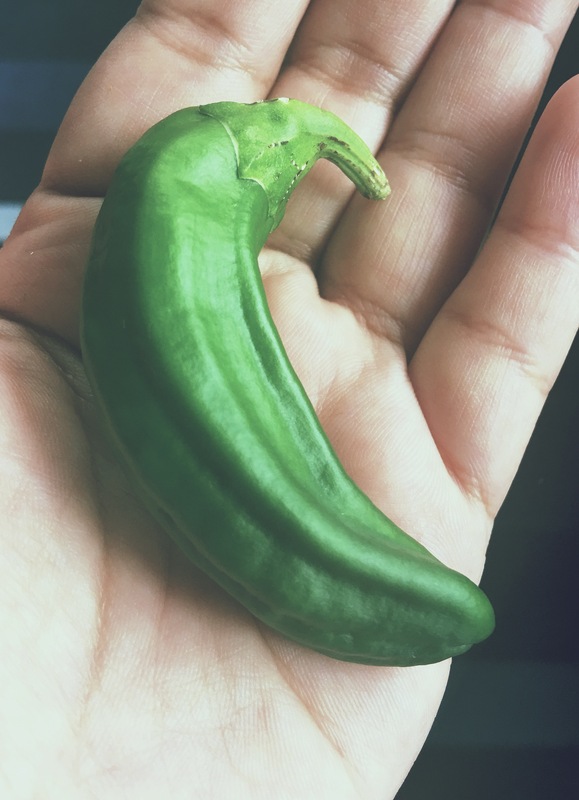 Today I was checking up on the leaves and stems when I literally screamed out in shock, behind the little leaves was this big fat chilli. What in the name of God, how can this even be possible? You can see how perfect it is. I wish you could smell it. It has this fresh, authentic, peppery, sharp aroma that is absolutely amazing! It proclaims – life. Against all odds, against all those white furry horrors, against cruel sharp cropping, this declaration of survival ….no, no, not just survival but a flourishing. Bambi had one look at it and went “woah” – it is such a piece of wonder; such joy on this Sunday grayness. Such a triumph.